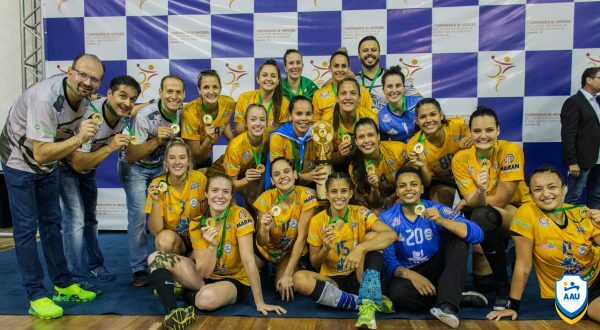 AAU UnC Concórdia (BRA) claimed the title on the first South and Central America Women’s Senior Clubs Championship and has booked a spot for the first ever IHF Women’s Super Globe to be held in China this year. Last Saturday marked the end of the South and Central America Women’s Senior Clubs Championship, the first continental tournament since the split of the Pan American Handball Federation. The event, which was held in Concórdia (Santa Catarina, Brazil), was disputed by 6 teams from four countries: AAU UnC Concórdia (BRA, national champion), UNIP/São Bernardo (BRA, national vice-champion), Club Manuel Dorrego (ARG, national champion), Club Ferro Carril Oeste (ARG, national vice-champion), Scuola Italiana di Montevideo (URU) and Vieux Gaulois (CHI). The competition, which started last Tuesday and finished on Saturday, had a round-robin format. The host team won their first four matches and tied on the last encounter against the other Brazilian team; they lifted the trophy due to the goal difference they had obtained during the tournament. The match was so tight even the first half finished on a draw (9-9). In the end, a penalty shot scored from Paraguay’s Sabrina Fiore gave AAU UnC Concórdia the goal they needed to draw the match and lift the trophy. The tournament showed a dominance from the Brazilian teams, which are a step ahead as they were the only professional or semi-professional teams on the competition. However, both Argentinian squads were very close to obtaining victories against UNIP/São Bernardo. The new continental champions have secured a spot on the first ever IHF Women’s Super Globe, which will be held in China later this year. What is yet to know is the number of teams that will participate or the format of competition. Thus far, AAU UnC Concórdia look like the first qualified for the ecumenic tournament. Why you didn’t post anything about Hansen and Neagu?